Try the DRAGONHAWK tattoo kit Risk-Free with Our Guarantee - Satisfaction or Your Money Back! Dragonhawk is specialized in creating various tattoo machines, tattoo supplies with every customers need. 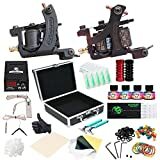 The products include tattoo machines, tattoo power box, tattoo inks, tattoo needles, tattoo foot pedal, tattoo grips and so on. Now our products were exporting to more than 20 countries, such as Europe, Middle East , Australia and so on. If you have any question, feel free contact us! This entry was posted on Tuesday, January 29th, 2019 at 1:56 pm	and is filed under Tattoo42. You can follow any responses to this entry through the RSS 2.0 feed. Responses are currently closed, but you can trackback from your own site.